Evaporative air conditioning system provide many advantages. One of the most popular reasons to choose an evaporative cooler is its energy saving benefits. 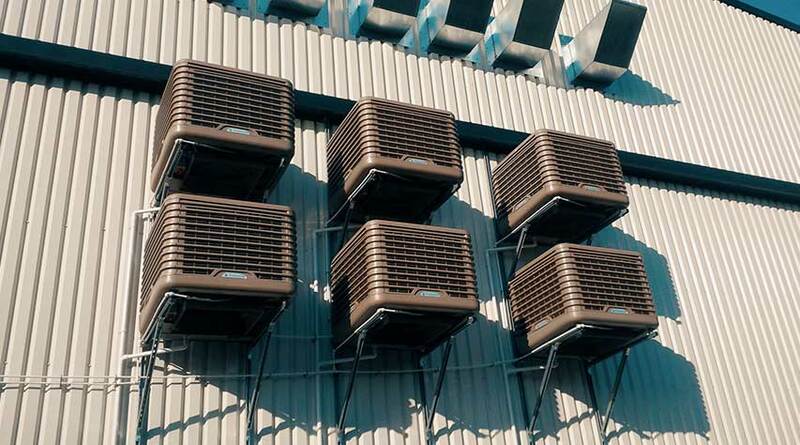 Evaporative air conditioners are a cost- effective way to cool your commercial building as they can use up to 80% less energy than the alternatives. As well as the lower running cost of evaporative air conditioners, they are also generally cheaper to maintain over time. The initial cost of installing an evaporative cooler to often cheaper than their counterparts. Another advantage of evaporative coolers is the enhanced ventilation and fresh air they provide to the building. Evaporative air conditioners take hot dry air from outside and convert it into cool fresh air. By not recirculating air over and over within the building, evaporative coolers provide a continuous source of fresh air. Because doors or windows need to be open for evaporative air conditioners to function, this could benefit buildings which need to remain open throughout the day, such as schools. The better air quality may also benefit many students in the classroom, particularly children suffering from allergies or asthma. Evaporative air conditioners are most suited to hot and dry climates. They do not work well in tropical areas and suit southern coastal areas and the majority of inland Australia. Evaporative air conditioners need to be maintained just like refrigerated systems. Services should be performed by a qualified technician who will ensure that your air conditioner continues to run efficiently throughout its lifespan. Regular services are important to prevent any small issues becoming costly repairs. Our Mouritz technicians are highly experienced in servicing and repairing air conditioning systems. By carefully inspecting all components for wear and tear we can identify any problems early. Even a seemingly minor component can cause serious problems if they fail. This is one of the most common reasons for a system to fail, and it could leave you and your staff feeling the heat if your system breaks down during the hot summer weather. Maintenance carried out by qualified technicians can ensure that your evaporative system continues to operate safely. The team at Mouritz can provide quality and reliable service and repair. Our service technicians are able to check for parts or components which need adjustment or replacement. Mouritz is one of Perth’s largest stockist of air conditioner spare parts, and with 40 years of experience this means that you can be confidence in our highly professional service for your air conditioner maintenance or repairs. If you would like to learn more about the benefits of evaporative air conditioning installation, service or repair contact our specialist team.